Click the links below to learn about our team members. 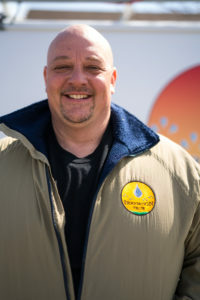 Gary Makowiecki is a 1978 graduate of Greece Olympia High school, and a 1980 graduate of Alfred State College with a degree in Agronomy and Environmental Protection. He spent 19 years at Van Putte Gardens. While at Van Putte’s he was a landscape foreman. Gary moved on to Irrigation Tech in 2000 as an irrigation installation crew member. From the spring of 2003 to the present he has been the installation foreman responsible for residential and commercial projects. Gary and his crew have been responsible for many athletic fields and office complexes as well as Stoney Creek Apartments, Linden Oaks Office Complex, Eastview Mall and several hundred residential properties. Gary married his wife Margaret in 1984 and they have lived in Greece their whole lives. They have two children. Gary and Margaret love to travel when they can, especially to the Thousand Island area of WNY, coast of Maine and the Adirondack Mountains. They have been to approximately 23 different states but none of those are out west…yet. They both enjoy working in their yard. Gary is a lifelong member of Messiah Lutheran Church. Gary is also on the Endowment Committee, an usher, a communion server, and also helps as a co-chair of their Woods and Water group (to schedule outdoor activities for the church members and their friends). Gary enjoys traveling with his wife, and hunting and fishing with his son in his spare time. In 2014, Gary won a small ice fishing derby on Braddocks Bay. He caught a 14.9lb, 39” Pike. Jeff Lucas joined Irrigation Tech in 2005. Jeff is unique in that he came on board knowing that he was being groomed for service because of his service background. He worked with the installation crew only six weeks before he was in his own service truck handling service calls. Jeff had seven years in the green industry working for Davey Tree and Lawn and One step Lawn care prior to joining our team. He also has two years experience as a service plumber working for a local plumbing company. Jeff graduated from Bryant and Stratton in 2008. Jeff married Carol Lynn in 2005. They had their first child Danny, who also shares the same funny birthday as Jeff, April Fools’ Day. Nathan, Jeff’s youngest son was born in 2010. They also recently bought their first house in Brockport and are enjoying all of the fun that goes along with homeownership. In addition to working here at Irrigation Tech Jeff volunteers helping to restore old computers that are refurbished then given to families that can’t afford them otherwise. Outside of work Jeff is very heavy into electronic repairs. He can fix everything from computers to game systems. This comes in very handy at work doing electrical troubleshooting. He also loves animals. He has a saltwater reef aquarium, three dogs (Ozzy and Lucky both Boston Terriers and Daisy the Black Lab), and Chloe the newest addition the cat. Joe Church began working for Irrigation Tech in 2007. He quickly became Gary’s right hand man and as such has become his second in command. Joe came to us from New York State Fence where he worked for 5 years. Prior to that, he was a cook for 12 years. Joe had his own fencing company for a short time too. Joe graduated from Red Jacket Central Schools in 1979. Joe likes to cook, tent camping, fishing and he refinishes furniture. He follows Syracuse basketball and the Buffalo Bills. Nancy Pospula is a 1977 graduate of Bishop Kearney High School. She worked at JP Morgan Chase for 21 years in various consumer and commercial loan servicing departments. She came to Irrigation Tech in 2005 after spending 6 years as a stay at home mom. During those years she volunteered in the class room and library at both Paddy Hill and Kirk Road Schools. At Irrigation Tech she is the voice on the other end of the phone, scheduling appointments, assisting customers, and taking care of the bookkeeping. Nancy and her husband Marty married in 1979. They have two children. Nick is pursuing a career in HVAC after completing his degree at Alfred State College. Ben is a sophomore at SUNY Fredonia, currently majoring in Computer Science. While in middle and high school Nick was a bass player in the Orchestra. Nick also worked on the installation crew at Irrigation Tech. Ben was very active in sports at school, playing baseball and basketball. He played trumpet in the Arcadia concert band. Ben has also helped out on the installation crew at Irrigation Tech. Nancy and Marty are active members at Our Mother of Sorrows Church. Marty plays guitar in the Contemporary Group and Nancy is a Eucharistic Minister and is involved in a ministry to make rosaries for soldiers. They enjoy walking, biking, and working on home projects together. Recently they started playing golf, and are enjoying trying different courses in the area. Nancy is an avid reader, and enjoys cross stitch, crochet, and quilting. Rich Higgins is the lead service tech at Irrigation Tech. He graduated from Marcus Whitman School in 1981. Prior to working at Irrigation Tech, he was the night manager at Bells Grocery in Canandaigua. In October of 1991 he answered an ad for irrigation laborers and began his time with Irrigation Tech installing the system at Penfield Country Club. For the next three years he was on the installation crew. In the spring of 1995, Rich became the first employee dedicated to the service of our existing customers. Rich married Lisa in 1984, Dan Marino’s rookie year. Lisa graduated from Marcus Whitman in 1983. They have 2 children. Josh born in1985 and Katie born in 1988. Josh recently made Rich and Lisa grandparents. Katie is studying Business and Communications at SUNY Oswego. Rich enjoys watching the Miami Dolphins lose football games and fishing. Tim Black is the founder and president of Irrigation Tech. He graduated from Hilton Central in 1979. He then went to SUNY Delhi to study horticulture followed by SUNY Environmental Science and Forestry for landscape architecture. During the summers between college years, he worked in the industry at Geyssen’s Nursery, Van Putte Gardens and for a small grading and excavation company based in Greece. For the first two years after college he worked full time for the grading and excavation company and began a landscape design/build firm part time. In 1985 his landscape company became full time. The company grew quickly and irrigation soon became a large percentage of the total work being done. In 1988 the decision was made to narrow the focus to irrigation only. Tim married Caroline, a 1977 Greece Arcadia graduate, in 1987. In 1990 they had their first son, Gavin and in 1992 their second son Alex. Gavin is currently working at a local restaurant when he’s not playing golf. Alex is attending Point Park University in Pittsburgh. He is studying musical theater and we are hoping to see him on Broadway in the near future. Both boys work on the Irrigation Tech installation crew from time to time. Tim and Caroline both enjoy gardening very much. They spend a fair amount of their limited free time in the back yard weeding, relocating and planting their new plant finds. They also enjoy just being outdoors and gravitate toward local and western NY parks for walking and biking trips. This gives Tim the opportunity to practice his photography. Tim is a member of the Rochester Rotary. Ted Karnath is a member of the Irrigation Association, A Certified Irrigation Contractor, and Certified Nursery Professional. He has been involved in many phases of the green industry, including golf course management, landscape design, installation, and irrigation contracting. He received an Associate in Applied Sciences degree from SUNY Cobleskill and attended SUNY Geneseo. For the past 13 years, Ted has worked as an Irrigation Specialist in upstate New York. He has provided classroom training, irrigation design, and product expertise to professional irrigation contractors, designers, and commercial/municipal facilities. His notable industry accomplishments include the Hunter Trail Blazer Award and the George Eastman House/New York State Nursery and Landscape Association Award. Joshua Griffin is the newest member of the team. Prior to entering the Green Industry, he was an equipment operator & truck driver. In 2013, he joined the Rainmaster Irrigation installation crew and found himself helping with service as well. In the spring of 2015, Irrigation Tech merged with Rainmaster. One important requirement of that deal was that we get Joshua as part of the package. Joshua grew up in Corning, NY. He came from a big family so there was never a dull moment. He is expecting his first child August of 2015. When not working, Joshua enjoys fishing, hiking and riding 4-wheelers. He also enjoys travel, exploring new places and meeting new people. Mike Kuhn is the newest service technician at Irrigation Tech. He began working on the installation crew summer of 2017 to learn the ropes. Prior to working here, he delivered hazardous materials and before that, he installed CO2 for pop and beer systems for restaurants and bars locally. fiancée, Kim. Mike enjoys fishing, hunting, camping, anything outdoors and meeting new people. William ‘Butch’ Costello returns to Irrigation Tech after a 13 year absence. He graduated from Wellsville Highschool is 1990. He then went to Belmont Vocational School where he studied conservation and heavy equipment. Butch worked in construction After graduating until 1997 went he began working for us. He stayed here until 2005 when he went back to construction, working for a large utility companywhich required him to travel quite a bit. Wanting to settle back down, Butch gave us a call and we were eager to welcome him back. Butch has three children and they enjoy fishing, hunting, watching football and watching Nascar.